East Londonderry DUP MLA Gregory Campbell says his party’s support for Mitchel McLaughlin’s nomination as Speaker was an acknowledgement “in word and in deed” that Sinn Féin did the right thing in moving on welfare reform. Mr Campbell made the comments at the Stormont Assembly on Monday (January 12) shortly before the Londonderry-born MLA, who represents the South Antrim constituency, was elected by 72 votes to 12. Whilst supporting Mr McLaughlin’s nomination, Mr Campbell said the DUP would continue to hold Sinn Féin to account, as he said it had over the controversial IRA commemoration in Castlederg in 2013 and, more recently, the welfare impasse. “In the past, when Sinn Féin has made wrong decisions and carried out wrong actions as part of the republican movement, we in this party have attacked and condemned it, and rightly so,” said Mr Campbell. “That was, is and remains our stance. We did it consistently when others walked away, and we will do it today and in the future. When it did the right thing, we acknowledged that it had done the right thing. 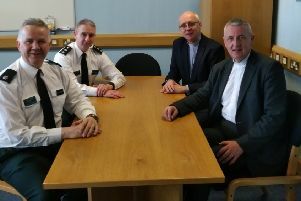 “For example, we acknowledged that, after many years of denying and usurping support for the police and the rule of law, at long last it had done the right thing. “But then, when it reneged on that, with things such as the murder parade in Castlederg, we told it that it was wrong, condemned it and said that there would be repercussions,” he added. Mr Campbell said the DUP warned Sinn Féin there would be repercussions after the latter reneged on a private agreement to implement welfare reform. “Thankfully, they have now moved from that position: from saying that they would not implement welfare reform, they are now implementing it. So, again, we acknowledge when they do the right thing, and we condemn them when they do the wrong thing. Today, we acknowledge in word and in deed when they have done the right thing,” he said. The East Londonderry MLA went on to say that the DUP will condemn Sinn Féin if it breaches commitments.